Strike from Underneath This had the enjoyable experience of interviewing Narrow Plains. Before reading the interview below, please read more about Narrow Plains from their bio sent to us by them and check out their music using the links listed. 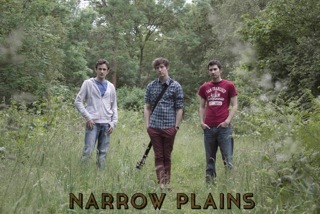 Narrow Plains are a three piece, acoustic-based,folk/rock band based in London, consisting of Charlie Ferriday (guitar/vocals), Stuart Connick (drums/back-up vocals) and Roger Connick (bass/back-up vocals). Their sound has been described as powerful heartfelt vocals and original acoustic riffs supported by a highly unconventional and simplistic,percussion set-up (with the cajon featuring instead of a bass drum) and mellow, fluent bass. focus solely on original, acoustic-based material. They self produced their debut EP, called “Somewhere in Between” and have also self produced a number of videos of their songs since. All of these have been released straight to YouTube and they are gaining a fast growing on-line following. They all believe passionately in live music. Over the last eighteen months or so, they have regularly performed at diverse gigs, mostly in London at a number of prestigious venues such as the 02 Academy2 Islington, 100 Club, Proud Camden, Barfly and even a one-off gig at the Cavern Club in Liverpool. They have written and performed a large number of new songs since the release of the EP and they are aiming to have completed recording of their debut album by early 2014. It’s actually an evolving process. I started off as a singer songwriter but nowadays we’ve grown as a band in our writing style. I’ll often bring in a new riff and a melody and from there it’s a collaborative approach, whereby we all help to construct the structure of the song and change things around. Even after our songs are written, we always revisit them to see if we can change them in little ways to improve them. We have grown as a band to be very honest with each other and have to be our own harshest critics if we’re going to write songs that we hope people want to listen to. We’re really looking forward to seeing what people think of our new album. In previous interviews, you have mentioned that the new acoustic/folk movement has shaped who you are. What does “folk music” mean to you? We are not folk musicians in the traditionalist sense although we do respect and enjoy traditional folk music. For us, folk music has become a broad church that encompasses a lot of styles, particularly after the folk revival of the 1960s and 1970s and more recently the new folk bands. To us, it is a type of music that is simple in construction and capable of being passed on immediately by live performance. At its best, it is uncomplicated and direct and touches on personal feelings that everyone shares. Your musical influences include Mumford & Sons, Ben Howard, Noah and the Whale, and Bon Iver. If you were to cover a song by one or more of these artists, which song(s) would you choose? We actually have already played covers from most of these artists. A big favourite in the past has been Winter Winds by Mumford and Sons. We tend to not play that many covers anymore but always look to artists like these continually for inspiration in making new originals. Of course! Music is never really gender specific, is it? Different voices and tones can be used to suit different melodies. We love Fleetwood Mac in the 1970s incarnation and the work done by Stevie Nicks and Christine McVie. More recently the music from Daughter and Chvrches has been great. There is something that can be amazingly haunting that comes from the higher reg-ister in a female voice. Which songs from your EP are most meaningful to you and why? I suppose that I like singing the lyrics best on “Somewhere In Between” be-cause they mean a lot to me personally but I think that, as a band, we enjoy playing “Running To Your Door” because it is a high energy song that gets people singing along with the chorus, which is always a great feeling. What are some memorable moments you have had while touring? We’ve been lucky enough to play a huge amount of gigs though – some great, some ok, some less good. 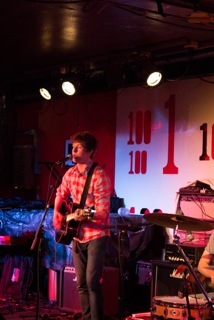 Perhaps, one of our most enjoyable was headlining the O2 Academy2 in Islington. 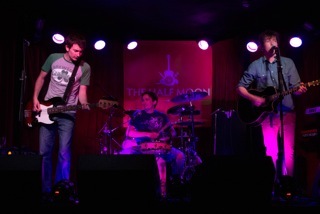 It was packed, we played a really tight set and the audience was massively enthusiastic. We played a couple of encores and could have gone on all night. Brilliant! We’ve also had nightmare moments as well such as a gig in Cambridge where I lost my voice 2 songs into the set with half an hour to go. We all have full-time jobs. I work in documentary production, Stu is in events management and Rog is an environmental consultant. So, with gigging, composing and recording with the band evenings and weekends, there isn’t a huge amount of time left over. Stu likes to climb and Rog and I are both into football. We all like to have breaks from playing music as you always write better when you can get away and obtain perspective sometimes. Our main project is writing and recording the songs for our debut album. We have been playing many of these live at gigs for quite a while. In fact, some of them, like Take Me Back and So Rewind, have become firm favourites with the crowd. They are all still a work in progress, but we are starting to get a lot happier with them. The main tasks now are to finish all the songs and then to find a way to release them. Ideally, we would find an album deal with a record company but we are quite prepared to go it alone again, if needs be. We still see ourselves as aspiring musicians! There are a lot of brilliant, talented people out there who are trying to make their way in music. Not every-one can become a star but ultimately the most important thing is that you are making music you are proud of and that you enjoy. We determine success by each new person that listens to our music and enjoys it. As long as you are feeling passionate about what you are doing, never stop. ← Interview: End of Neil !